One of the most dreaded diseases mankind has faced in recent times is cancer. Because of high morbidity and mortality rates that cancer brings it is a fearsome disease. When we hear about cancer no one believes that it can happen to them or to anyone else close. But the reality is far from this. The rapid changes in the lifestyle have caused even more rapid increase in diseases like cancer and ridding a patient of cancer is huge challenge because of the complex nature of the disease. All of us at one point in our lives have seen or heard about somebody suffering or dying of cancer. Though, the leading causes of breast cancer remains the lifestyle changes in recent times, there are many more reasons for lives lost fighting this disease. One of them being delayed introduction of effective breast cancer screening and diagnostic programs; also limited access to treatments is another major cause for patients dying. If detected at an early stage, breast cancer is almost 100% curable. The early detection of breast cancer can be achieved by genetic testing or what we refer to as molecular diagnostic testing. Clinical genetic testing is revolutionizing the diagnostics by providing insights into the disease at genomic level. This information is not only helping the clinicians to make informed decisions regarding the disease prognosis but is also helping in designing a personalized treatment plan. Today the field of molecular diagnosis is as sophisticated as it could ever get. The testing has become very accurate and advances in the field are helping the clinicians to get an understanding of the disease at molecular and genetic level. Molecular diagnostics allows one to query the genome at a single nucleotide resolution with very high accuracy. It is capable of detecting changes in a specific sequence of DNA or RNA that may be causing the disease. These include SNPs or MNPs (single or multiple nucleotide polymorphisms), insertions, deletions, translocations, and copy number changes in the DNA. This type of diagnosis is not only helpful in deciding the therapy but is also finding a way to clinical application in an area like breast cancer. It is empowering clinicians with greater understanding and thus helping in a better treatment plan for breast cancer. Molecular diagnosis of hereditary breast cancer is majorly based on the identification of germline mutations within the BRCA1 and BRCA2 (BRCA1/2) genes (the mutations that are present in the body’s reproductive cells and are therefore passed to the offspring from parents without fail). BRCA1 and BRCA1/2 are tumor suppressor genes and mutations in these genes account for at least 25% of hereditary breast cancers and approx 5% of all breast cancers. Many other genes like, CDH1, PTEN, STK11, TP53, ATM, BRIP1, CHEK2, NBN, PALB2, RAD51C and RAD51D have been identified; mutations in which confer an increased risk of breast cancer3. The identification of mutations involved in breast cancer can be achieved easily at low cost by using genomic technologies such as NGS. NGS enables massive parallel sequencing of billions of strands of DNA and enables one to read DNA sequence with very high resolution. Next generation sequencing is very informative in the sense that one can detect changes at the base level or detect large breaks in the DNA or detect Copy number changes. Any such changes in DNA could lead to disease. As the output of the sequencing process is terabytes of data from a single genome, the need to analyze millions of these reads accurately is extremely important. To achieve this, one needs appropriate informatics tools that can align the data to a reference genome and then analyze multiple genes. 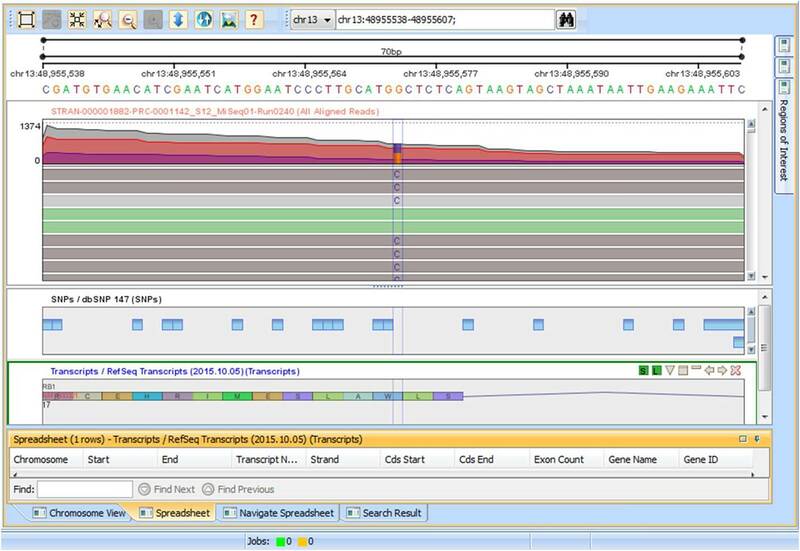 Bioinformatics software like Strand NGS is an appropriate tool to read the sequencing output from genomic and transcriptomic data. It can also read and analyze the sequences from your epigenome. Strand NGS can identify causative mutations in breast cancers with very high resolution and accuracy and one can easily find if any of the genes carry mutations that could cause breast cancer. These tests can also be done in the family members of the patients who are predisposed to inherit the breast cancer running in the families to gauge their risk of disease development. Data analysis in Strand NGS is pretty exhaustive. The tool allows importing of the raw reads and aligns them against the reference genome. The alignment is pretty fast in tool and then the data can be analyzed for the detection of small genetic events like presence of SNPs or larger genetic changes like deletions, inversions, translocations, or copy number changes (if at all any of these changes is present in the data). Any finding in your data can be verified in detail in genome browser (Fig1.) and detection of a known mutation or novel mutation can be confirmed in genome browser visually as the data is smartly organized in tracks in juxtaposition to dbSNP database or to the transcripts. The tool also offers other visualizations like variant support view (Fig.2) to have a quick look at the overall quality of the bases in the neighborhood of the variant called by the tool to ascertain the quality of the bases before making a variant call. Fig2. Variant Support View. The view enables visualization of data independent of genome by grouping together identical reads. This is a good option to confirm insertions, SNPs and InDels in the data. Strand NGS can perform SNP effect analysis on the SNPs detected so that the effect of the SNPs on the genes and phenotype can be determined. SNP effect analysis also yields a list of affected genes. The mutation data is represented in the HGVS format by the tool. Strand NGS provides full support to HGVS notations. HGVS is the international standard for variant nomenclature approved by Human Genome Variation Society (HGVS) for reporting variants and information exchange in DNA diagnostics. The SNP description at Genomic, Transcriptomic (cDNA), and Proteomic levels make it easy to comprehend the biological effects of variants. If a given variant has multiple consequences, each is described in a separate row. (Fig.3. and 4). In case of samples that are paired tumor-normal samples, Somatic detection step can be used to categorize the detected mutations into somatic and germline mutations. Fig.3. SNP Effect Analysis report: The variants are represented in HGVS notation. The variants with multiple consequences are shown in multiple rows. Fig.4. A variant results in changes for two transcripts of a gene on the negative strand. The importance of the NGS based methods to assist in the better diagnosis of diseases like breast cancer and use this information to make decisions regarding better prevention and cure of disease cannot be underestimated. Recently, a study from Strand Life Sciences reported detection of high frequency of mutations in breast and ovarian cancer cohort suggesting that the NGS-based multi-gene testing increases the sensitivity of mutation detection and helps in identifying patients with a high risk of developing cancer as compared with sequential tests for single-genes4. They reported a high prevalence rate of 36.2% of mutations in an Indian cohort and the rate is even higher 52% when familial cases were considered. Their data strongly suggests that incorporation of NGS-based multi-gene panels for routine genetic testing and using bioinformatic tools like Strand NGS for analysis of NGS data can be helpful in early detection, prevention and better management of hereditary breast and/or ovarian cancer. In current times, more and more physicians are looking for such information to better aid their decisions and it is actually helping too. Integrating genome sequencing information with clinical practice as a standard care is still going to take some time due to the challenges that this technology poses; like analysis, interpretation, and validation of large number of genomic events in a sample to management of mountains of data that sequencing outputs and economics of such tests. Because of these problems, there is an imposing need for bioinformatic tools like Strand NGS that could read and analyze the huge information in the genome along with management of data. In spite of all these challenges, it is an exciting time in the field of molecular diagnostics. Torre, L. A., Bray, F., Siegel, R. L., Ferlay, J., Lortet-Tieulent, J. & Jemal, A. Global cancer statistics, 2012. CA Cancer J. Clin. 65, 87–108 (2015). Ferlay, J., Soerjomataram, I., Dikshit, R., Eser, S., Mathers, C., Rebelo, M. et al. Cancer incidence and mortality worldwide: sources, methods and major patterns in GLOBOCAN 2012. Int. J. Cancer 136, E359–E386 (2015). Meindl, A., Ditsch, N., Kast, K., Rhiem, K. & Schmutzler, R. K. Hereditary breast and ovarian cancer: new genes, new treatments, new concepts. Dtsch. Arztebl. Int. 108, 323–330 (2011). Mannan, Ashraf U; Singh, Jaya; Lakshmikeshava, Ravikiran; Thota, Nishita; et al. Detection of high frequency of mutations in a breast and/or ovarian cancer cohort: implications of embracing a multi-gene panel in molecular diagnosis in India. J Hum Genet. 61(6), 515-22 (2016).